Pond's had a new line called White Beauty Naturals. It's supposed to be a line targeted for skin that has been saturated with pollution, like us living at Jakarta. This line claims to contain antioxidant in the form of Camellia leaf extract that might help fight those free radicals destroying the facial skin. These products claims to also help reduce the formation of melanin, thus enhancing skin brightening. I was amazed that they have these claims, so I went to Hypermart in search for this new line from Pond's. It's such a shame that I can only find the foam cleanser, not the day and night cream from this line. If anyone have seen this line, please leave a comment below on where I can find them. After trying them for around two weeks-ish, here is my review. Considering the Camellia sinensis leaf extract is the second last ingredient, I highly doubt that this will act as an antioxidant. I squeeze a 2 cm line on the tip of my index finger and rubbed it together to lather. Massage it into circular motion and rinse. The product has a squeeze tube packaging with a flip cap at the end. Very efficient. The color theme of the product. I like looking at the product, the green is very chic and simple. It has tiny beads for exfoliating. It has that squeaky clean feel each time I pat dry my face with a towel. I feel that it just strips all of my oil from my face. I broke out using it after 2 weeks. When this review is up, I've only been using it for a week. So, that's sad. I not a strong believer of expensive face washes and I always pick drugstores ones. I've tried high end ones from Kanebo, Clinique, Hada Labo, etc. I compared the ingredients of the high ends and drugstores, which are almost 90% the same. The differences are only based on the fragrances and colorants used more often in high end face cleansers. Anyway, this is an average cleanser, with a cheap price tag. It cleanses my face well, doesn't break me out it did break me out after 2 weeks use, but I think it's more suitable for oily skin type. 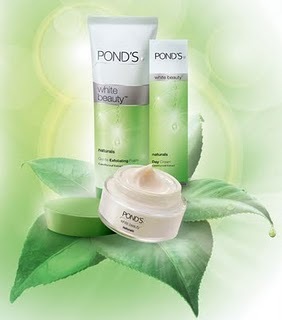 DeBi, I'm a new user to Ponds. It made me break out sometimes, especially when I use their day and night creams. Probably because of the 'talc' inside them. wah kalo beneran buat oily skin makin wajib dicoba nih..
@cominica-ai wahh itu ada yg lg jadiin product ini buat giveaway, ikutan aja sai.